Jeddah Corniche is a beautiful coral reef, represents the waterfront and one of the main landmarks and tourist destinations in Jeddah city. It is an important recreational facility for residents and visitors. 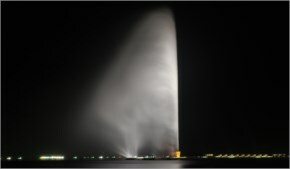 The Corniche extends over 130 km along the Red Sea coast, and is characterized by five stars’ hotels, malls, amusement parks and adorned with Jeddah fountain. The Corniche is divided into three sections: the north coast, the southern coast, and Sharm Abhor. 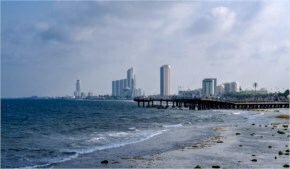 There are a lot of projects implemented in the Corniche area, especially those related to towers and skyscrapers and hotels, the most important of these projects are Kingdom City and Lamar Towers. The implementation of the north Corniche project has been completed, to become a public park for the people of Jeddah and other visitors, enjoying the aesthetic formations and the magnificent sculptures that a number of Arab and international artists contributed in carving and forming them. Some areas were constructed to allow all the society members and other visitors to enjoy the coast and see the sea. In addition to the green sessions, footpaths, the aesthetic sculptures, botanical gardens and pedestrian bridges which facilitate the movement between these areas. Interactive fountains were also designed and executed, they were designed in different original shapes such as waterfalls, tubal, hierarchical in addition to reflective water pools. During the design phase, it was taken into consideration to dedicate special equipped places to receive families,such as covered seating areas and colored granite benches, all the areas were also covered with lighting poles, and headlamp with aesthetic designs, in addition to high speed wi-fi service and distinctive modern audio system for announcing the five daily prayers. Camera surveillance CCTV systems were also implemented in the corniche, and prayer sites were provided in addition to children’s toys area filled with a wide variety of games and toys serving different age segments, also, public toilets and paid toilets were also provided. Moreover, sandy beaches, fishing pier, maritime taxi parking and stairs leading to the sea will soon be implemented.